Shop at: www.etsy.com/shop/eksayanek for fabric accessories, tote bags, gifts and more! A range of new utility and toilet bags in fun Block Printed Pyjama Stripes! New Products and a Fun Little Shoot! We had a fun little shoot at a friend's place who kindly let me do what I wanted in her beautiful home. Totally loving our new denim collection in a beautiful dark and regular blue! I personally feel that this cushion is a perfect match for your teen's room! Since the weather was unpredictable I only managed to shoot a few pieces, hopefully we will plan another one soon. I will keep adding to the bird collection and perhaps make a total of 5 different birds, what do you think? We wanted to keep it fairly casual and natural so the backdrop of her shed worked out just fine for our cushions. Some new cotton stitch resist pillow covers are also in store now available in a beautiful charcoal, indigo and madder. Beautiful hand painted Madhubani Folk Art on 100% Silk Cushion Covers are now available in store! Grab yours now! 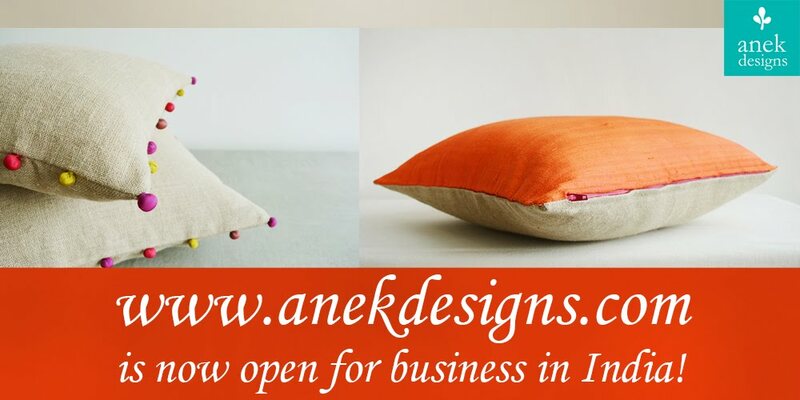 I wrote a Guest Blog some time back while I was setting up my domestic shop www.anekdesigns.com. The Blogs I was writing on my new shop were not getting published here and so after much investigation ;) I have managed to now link And Another to my online shop www.anekdesigns.com! The blog was on one of my favourite Indian Textiles, Ikat and was published on blog 'Peacocks in the Rain.' Read it here. I wrote this post for my dear friend Ila's Blog Peacocks in the Rain and it is a beautiful blog dedicated to Indian Design, Crafts and Products! You will love it, I promise!